“George, I’m going to open a jazz club. Can you give me some advice?” I think he called the wrong guy. Boston, 1950-1960, George Wein’s Storyville. “The Birthplace of Jazz”. Ten years of the finest music jazz had to offer: Duke, Louis, Ella, Miles, Dizzy. Everybody existed. We had fun, but it closed without a dime in my pocket. In 2001, I had a disastrous experience with a club on Bourbon Street. New Orleans is not New York City where a $20 – $30 cover charge is commonplace. Not New Orleans $5 – $10 music charge is scale for jazz (Preservation Hall, Snug Harbor, etc.) In the Crescent City, tourists and locals spend money on food. Music is like the air we breathe, free and in the street ambiance. My associate, Ralph Brennan from the famous New Orleans restaurant family, ran the room. My advice as an investor was” Have a restaurant with music, not a jazz club that happens to serve food.” Unfortunately, circumstances made this impossible and the New Orleans club folded in less than a year. I was proud to have “the” Danny Meyer ask me for advice. “Danny, if you want to have a success, make sure you have a restaurant with music, not a jazz club with food.” This echoed my advice to my friends in New Orleans. But Danny Meyer is a smart guy, smarter than most people I know, including me. He birthed both. A restaurant on street level (Blue Smoke) and in a cellar below, The Jazz Standard, a jazz room serving food from the upstairs kitchen. But did Danny spawn a place specializing in the international cuisine he is noted for in The Union Square Café and The Gramercy Tavern et. al? No! He opened a rib joint. Barbecue! 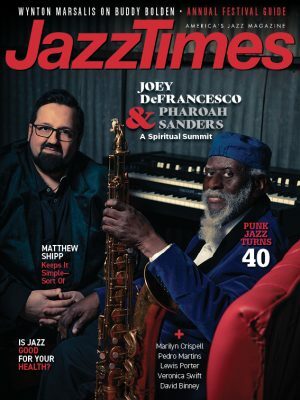 Success was instant and now the Jazz Standard has taken its place along with the Vanguard, The Blue Note, Iridium, Dizzy’s at JALC, along with others that are the foundations of jazz in NYC, the jazz capital of the world. On this particular January night, there was a singer appearing who he wanted me to hear. So Andrzej drove me down to East 27th Street (west of Lexington Ave), which seemed to have considerable more activity than Wythe Avenue in Brooklyn when I went to Zebulon. As I entered the building, the smell of Kansas City hit me right in the nostrils. I couldn’t wait to get downstairs so I could choose what ribs I could chew on for dinner. The solid banisters in the stairway made my descent to the club uneventful. As I was being seated by the friendly crew, the lights dimmed before I could decide whether I wanted the Kansas City ribs, the Memphis Baby Backs or the Texas salt and pepper beef ribs (smoky flavor). Because Gretchen Parlato had already been introduced, I made it easy for the waitress: I ordered fried chicken. Gretchen Parlato, a slim, quite beautiful young lady, sings most of her songs in Portuguese. It wasn’t long before her performance captured the audience. Gretchen was accompanied by a marvelous pianist, Gerald Clayton (the Clayton family’s future in jazz). I was sitting with Tim Jackson, producer of the Monterey Jazz Festival. His son Bennett is earning extra curricular credit working for the CareFusion Festival while getting a degree in recorded popular music at NYU. (I took pre-med in college. In my day, there were no majors in jazz or popular music. If there had been, I might have been an all “A” student, instead of being blitzed by chemistry, physics, biology and organic chemistry.). Both Tim and I liked Gretchen Parlato. (I think he has asked her to appear in Monterey this year.) I asked Gretchen to perform in June on the CareFusion Jazz Festival in New York at Symphony Space. Symphony Space has become a bastion of culture on the upper West Side. In addition to dance, literature and classical music, Laura Kaminsky, who is the associate artistic director, likes to present jazz. There are two concert halls at Symphony Space: The Peter Jay Sharp Theatre (700 seats) and the Leonard Nimoy Thalia (200 seats). Both are comfortable and the acoustics are perfect. I have produced several concerts over the years at Symphony Space which have had varying degrees of success. I feel there is a territorial void for jazz on the Upper West Side. Jazz in Manhattan starts in the Village and Soho and more or less peters out after Columbus Circle (JALC). Not until Harlem above 110th Street do you find much music. Symphony Space at West 95th Street and Broadway is a good location. The subway (96th St.) and busses drop you right at the door. One of the problems Symphony Space has is due to the divisionary demographics of Manhattan; its basic clientele is above middle age. (The same situation exists at the 92nd Street Y on Lexington Avenue. Every time I speak or play uptown, when I look at the faces in the audience I feel like a kid. I’m 84 years old. Laura Kaminsky had an idea for a program at the Leonard Nimoy Thalia. She had the opportunity to present two artists who have been on the jazz scene for quite awhile, Sheila Jordan and Jay Clayton, two wonderful performers (June 24). But Laura asked us if we had some new faces that were available to indicate how jazz singing is still a vital part of the music scene. Just a few weeks earlier Seth Abramson had introduced Kat Edmondson to me at a dinner at the Cuban restaurant Guantanamera (8th Ave @ 55th St) where the food was good and the music on a postage stamp stage was fantastic. Kat is young and pretty. She gave me a CD (they all do). I was impressed by what I heard, so I suggested to Laura a concert with Gretchen Parlato and Kat Edmondson (June 25), so those lucky enough to attend both evenings will have a clear view of several styles of jazz singing, what is happening now and where it has been for many years. I have always used the expression “Jazz is a music from J to Z”. I have felt this from almost the beginning of my career. At Storyville I had Art Tatum play with Sidney Bechet and at a Sunday afternoon jam session I asked Charlie Parker to play with my group, which featured Doc Cheatham and Vic Dickenson. Bird blew us away on Royal Garden Blues. The first night of the Newport Jazz Festival, 1954, along with Dizzy, Billie Holiday, Gene Krupa among others, I programmed Eddie Condon, with Bobby Hackett, Pee Wee Russell, etc. to appear on stage before Lennie Tristano with Lee Konitz and Warne Marsh. So I asked Laura Kaminsky to work with the Sidney Bechet Society in presenting an evening in New Orleans (June 23) featuring Evan Christopher, John Allred, Ari Roland and Eli Yamin. Evan ranks with Anat Cohen and Ken Peplowski as my idea of a clarinet triumvirate. Rio and Laura came up with the idea of the Jazz Gallery All-Stars. I jumped. So, quickly Rio contacted artists who had been given exposure and introduction at the Jazz Gallery, which is a non-profit presenting organization in an 80-seat attic on Hudson Street near the Holland Tunnel. Artists who have agreed to be part of this stunning group include: Claudia Acuña, Ambrose Akinmusire, Lage Lund, Gerald Clayton, Ben Williams, Pedro Martinez and Roy Hargrove. The concert should sell out, particularly since Symphony Space has agreed to a ticket price of $15. I saw Roy Hargrove a few weeks ago at the Blue Note. He was a guest performer with Roy Haynes, who was celebrating his 85th birthday week with a host of different guests, including Bill Cosby, Chick Corea, Kenny Garrett and Christian McBride. The evening I chose to congratulate my Boston buddy, who was the house drummer at Storyville back in the long ago 1950’s, Hargrove was featured. The Blue Note was packed. The room was darkened and pin spots lit the stage. Jaleel Shaw and Roy Hargrove, supported by Roy Haynes, who in my mind is the best of extant drummers, were playing beautifully. About the third number, they slipped into a minor key blues, at a silky medium tempo. It was gentle swing at its best as only drummer Haynes could inspire. As Jaleel poured his heart into his soprano sax, my thoughts began to wander and when Roy Hargrove worked his way into several muted trumpet choruses, I was transported. It’s difficult to describe my mood, but Roy and Jaleel became symbolic figures – two anonymous African-Americans, expressing joy, love, and at the opposite end, life’s frustrations, through their horns. I was no longer at the Blue Note with Jaleel and Roy Hargrove, I could have been in Paris on the Rue de la Huchette, in a jazz cave with Bill Coleman and Sidney Bechet, maybe I thought of Frankie Newton and Pete Brown in a crowded Greenwich Village café. I certainly felt Roy Eldridge and Coleman Hawkins in the Three Deuces on 52nd St. It also could have been Miles and Bird in the Club Next Door. But style or era didn’t matter. The mystique and romance of jazz took over. It was easy to realize why jazz stays forever in the lives of those who get its unique message. I want to thank Roy Hargrove for the voyage into timelessness that he gave me through his muted solo. Roy was born to play the trumpet. He plays like he loves music, the ultimate compliment.